In North America, breast and ovarian cancers are leading causes of morbidity and mortality in women. Tumours arise through continual accrual of mutations in their genomes. The process by which mutations accrue has a random component, thus individual cells within a tumour can acquire different mutations. This diversity within a tumour results in populations of cells that exhibit different molecular characteristics under the principles of Darwinian evolution, and thus may respond differently to therapy or acquire different abilities to invade and metastasize. Despite these widely accepted views, genetic diversity within tumours is rarely considered in treatment protocols, yet it is believed that it contributes to drug resistance, spread, and disease progression. Recent breakthroughs in sequencing technology have now enabled researchers to precisely identify mutations in a tumour’s genome and application of this technology has yielded preliminary insights into the extent and nature of tumour evolution. However, accurate information about how these mutations govern behaviour at the single cell level has remained elusive. 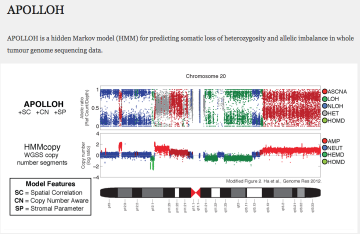 In the most recent issue of Genome Research, Dr. Sohrab Shah‘s team has presented APOLLOH (http://compbio.bccrc.ca/software/apolloh), a novel and innovative software tool that can be used to further elucidate the dynamics and clinical implications of tumour evolution in a translational research setting, using samples from patients with Triple Negative Breast Cancer. This novel computational solution will enable the cancer genomics community to take full advantage of the power of new sequencing technology to study the patterns of evolution. These methods can be applied to additional types of breast and ovarian cancers to quantify patterns of evolution that can be predictive of clinical end points.